Another complete oddity. In October 1997 Mamoru Oshii announced he was making a new live action film; "The Record of Garm War" or "G.R.M." for short. To see if his ideas for the film were feasible, several pilot films were created including a short live action piece and oddly an anime pilot film, presumably made in an attempt to salvage the concept if it wasn't made into a live action film. For whatever reason another pilot film was made, a CGI/live action Patlabor pilot film in 1998. The film doesn't really have a plot as such. It begins was a panoramic shot of Tokyo Bay at dawn and pans over to a Labor which is test firing a gun. The second scene takes place in daylight in the middle of a busy Tokyo street. The Labor walks through traffic, down a street and past a Basset Hound (one of Mamou Oshii's visual trademarks). The final scene, filmed as if it were shot on a shaky video camera, has the Labor pitted against a helicopter gunship. People run for cover and shots are fired. Eventually the pilot of the Labor has the helicopter in his sights and shoots it down. The film is set in the year 2003 and the Labor is a brand new design, not seen in previous Patlabor anime or manga. 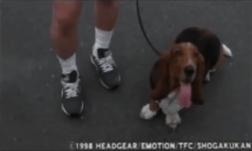 An alternate version of the pilot film includes an alternate shot of the Basset Hound on a leash being held by a young girl. "The Record of Garm War" project was eventually shelved (Oshii had moved on to making a similar film, "Avalon", which was released in 2001), but in October 2012 it was yet again announced as in production by Canadian film production company the Nakamura Group Advantage. However no announcement was ever made in relation to a feature length live action Patlabor film. 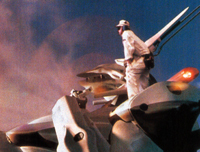 It was hard to determine if the pilot film was a serious attempt to see if a real live action Patlabor film was feasible, or if it was just was merely a test by Oshii see how computer animation would work in a live action film. Though Bandai Visual did publicly state that no actual full length film would be made. However in 1997, French director Christophe Gans announced he was making a live action Patlabor film. Whether it was a deliberate attempt to scuttle that project, part of a collaboration or test for Gans or just a test on Oshii's part to see what he could do with CGI, no one would say. Eventually in March 2013 at the Tokyo International Anime Fair, the Tohokushinsha Film Corporation announced that they would be producing a Patlabor live action project due for release in 2014. After the pilot film was created, it appeared in a number of media and events mainly as a promotion tool. The pilot films for "The Record of Garm War" and the Patlabor live action film were shown at a number of film festivals as a part of a retrospective of Mamoru Oshii's work. This included the Yubari International Fantastic Film Festival in 1998 and the Tokyo International Film Festival in 2001. In December 1998, the CG models were used in the artwork of the first DVD releases of the first two Patlabor movies. The February 1999 issue of Animage magazine included a two page spread on the pilot film, and a ton of stills from it as part of the promotion of the DVD releases. The both versions of the pilot film as well as a 30 second promo were first commercially released as extras on the Playstation video game "Patlabor - Game Edition" which was released in November 2000 in Japan. It was also later released commercially on "Patlabor DVD Memorial Box" in May 2007. The soundtrack to the film, by Kenji Kawai, can be found on the "Cat Nights" disc of the CD box set "Kenji Kawai Cinema Anthology". Below is a selection of images from the pilot film. This pilot film is not available in English anywhere commercially. However both the 30 second promo and both full length pilot films can be found on various streaming sites. Because I only like to support official releases, I won't be providing any links to download this video. A 30 second promo and both versions of the pilot film appear as extras on the Playstation game "Patlabor - Game Edition" released by Bandai in November 2000. As this is a NTSC format Playstation game, check your instruction manual to see if your Playstation can actually play it. One version of the pilot film appears as an extra in the "Patlabor DVD Memorial Box" in Japan from Bandai Visual/Emotion. The DVD box set is only available in Japan, and therefore will only work on DVD players that are both NTSC compatible and will play region 2 discs (if you don't live in Japan, check your DVD's instruction manual to see if it will play the discs). Please see the Software and Computer Games List and Japanese Original OVA Releases for a complete listing of all releases, formats and product specifications for the pilot film and commercials. A GWEI Product. ©2003 - 2018 GWEI. 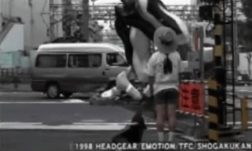 Patlabor the Live Action Movie ©1998 Headgear/Emotion/TFC/Shogakukan. All other logos/trademarks are copyright of their respective owners/companies. Used for review and illustration purposes only.